So I'm totally getting into this embroidery thing. I wasn't expecting to like it this much. For Father's Day I made an embroidered set of Everyday Napkins for my dad. I've influenced him in other "greener" choices, for example light bulbs and bringing his own bag to the grocery store. And I am hoping that if my parents have a beautiful set of everyday napkins that their daughter spent hours embroidering by hand they will be guilted into using them and giving up the paper variety. 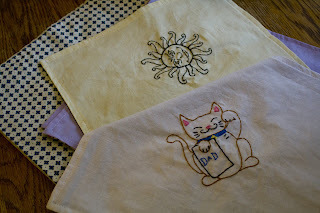 The cat napkin is from Sublime Stitching Craft Pad, it's fantastic! Wow. Those are so cute! What a great gift. Yes they are wonderful. We enjoy them. I have to say it is hard to use them because they are so pretty.